Italians lived in Connecticut; fifty years later there were over 80,000. By 1900, 23 percent of Connecticut’s residents had been born abroad and another 27 percent were first-generation Americans. 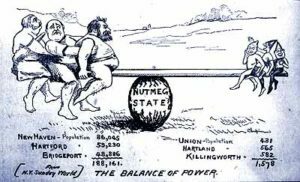 Immigrants satisfied Connecticut industry’s relentless appetite for workers, but Connecticut’s cities strained to accommodate them and the state’s Yankee population refused to accept them. By the turn of the century, the town-based system of representation (that assured one-party control of the House of Representatives) and the 19-month interval between sessions made the legislative process increasingly sluggish and unresponsive to the challenges of a swiftly changing society. 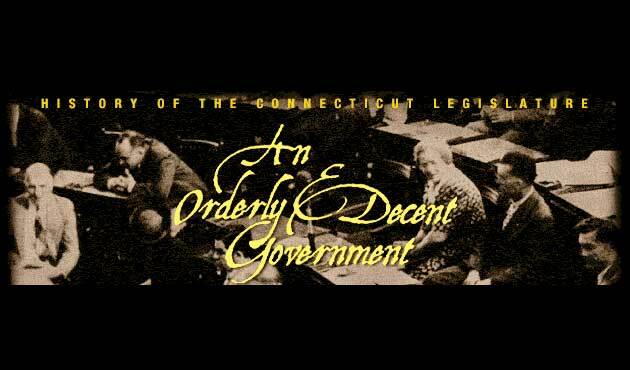 In 1891, Connecticut’s political process completely ground to a halt when the General Assembly could not agree on who won the gubernatorial election of 1890. The parties wrangled for an entire year, no bills or appropriations were passed, and the incumbent governor, Morgan Bulkeley, paid the entire expenses of the state from the budget of the Aetna Insurance Company where he served as president. Appalled reformers intensified their calls for an end to the ancient system of town-based representation. 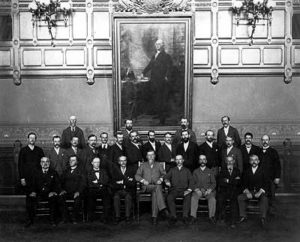 Finally, in 1902, delegates met to prepare a new state constitution for the voters.